This is a Quiz or you can use it as a Trivia on the movie INVICTUS by Clint Eastwood with Morgan Freeman and Matt Damon. I hope it can be useful! I uploaded the ANSWERS!!! sorry i didn´t do it before. ENJOY! 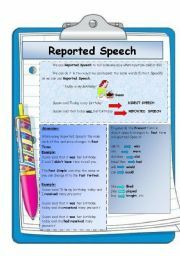 I have prepared this material on Reported speech so you can practice with your students. 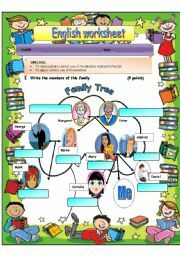 This is a worksheet to practice Possessive using Family members. 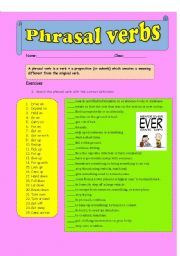 This is a list of 25 PHRASAL VERBS, with activities and answer key. Leave a message if you like it! 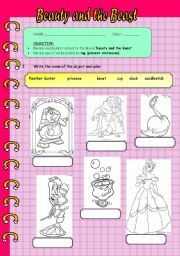 This is a worksheet to practice Present Continuous and vocabulary based on the movie ´The Beauty and the Beast´.I made it as a complementary activity to the book English Adventure level 3 by Longman. I use it with my very young students because it is an elementary level activity. i hope it can be useful. Enyoy!!! This is a worksheet students can use to practice Comparatives and Superaltives forms of Adjectives. This is a worksheet to practice there is- there are using objects at home. Vocabulary. 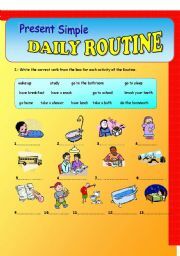 This worksheet is for students to practice verbs related to Daily Routine and some sentences in Present Simple. This is a set of Flashcards for Shops Vocabulary for elementary students. This is the first part of a set of 10 flashcards with basic vocabulary to request food in a restaurant. This is Part 2 of a set of slides with Vocabulary related to cooking for elementary students. At the end you have a recipe for a Chilean dish. I hope u enjoy it. This is Part 1 of a set of slides with Vocabulary related to cooking for elementary students. At the end you have a recipe for a Chilean dish. I hope u enjoy it. This is the second part of a set of 10 flashcards with basic vocabulary to request food in a restaurant. Enjoy! This is Part 3 of a set of slides with Vocabulary related to cooking for elementary students. At the end you have a recipe for a Chilean dish. I hope u enjoy it. This is Part 4 of a set of slides with Vocabulary related to cooking for elementary students. At the end you have a recipe for a Chilean dish. I hope u enjoy it. 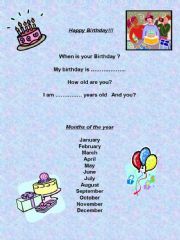 This is basic vocabulary realted to months of the year and Birthdays.